His name seemed destined for great things in the pages of rock history having hit number 1 in half the planet with Stiltskin's Inside and after being asked to replace no less than Phil Collins himself as the lead singer in Genesis. Things with Genesis didn’t quite work out and, after a single album and tour, Ray Wilson was forced to restart his career from scratch. This book, the first of its kind, covers his brief flash of fame with Genesis but also wants to tell the tale of the young Scotsman with a magnificent voice, no longer the moody young upstart of 1997, but the seasoned stage veteran of close to twenty years. 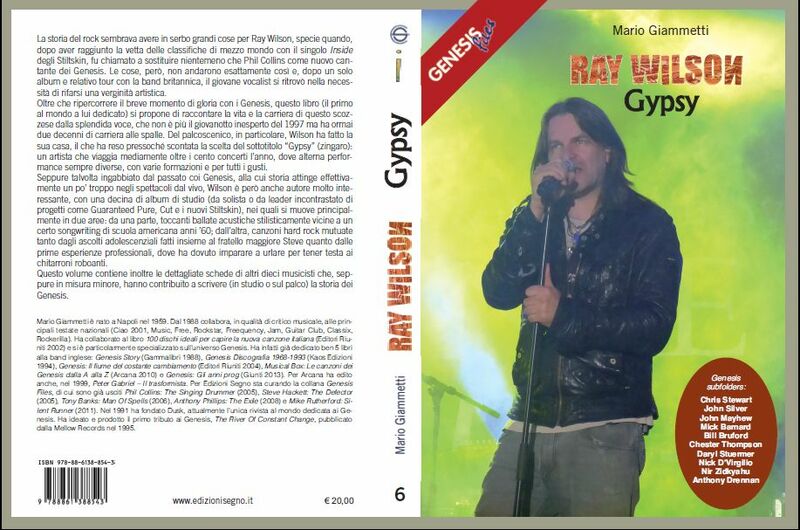 Ray really comes alive on the stage, which really made the title of the book, Gypsy, a no brainer. How else can we describe a man who plays an average of over a hundred gigs a year? Each concert, arrangement and line up a thing unto itself. Sometimes trapped in the ‘golden’ Genesis era, which Ray perhaps relies on a bit too much in his live shows, Wilson continues to be a very interesting songwriter with a good number of albums under his belt at this point, both as a solo artist and as a leader of bands such as Guaranteed Pure, Cut and the reformed Stiltskin. His writing extends between touching acoustic ballads, close to a certain American songwriting of the Sixties, and hard rock, coming out of his adolescent experiences with his elder brother Steve and his first professional work, where he had to make himself heard over a wall of guitars. This volume also looks at the lives and works of another ten musicians each of whom contributed, in the studio or on the stage, to making the history of Genesis what it is.